With a little luck, as you read this, I am in Victoria, British Columbia (Vancouver Island), on a bus headed to the famous Butchart Gardens, but that story will come later. During the years I was in my motorhome at Christmas, I collected village pieces and after I stopped for the holidays, I would arrange them in my front window with white cotton and put a string of lights around them. If I couldn’t be with family, I could still enjoy the beautiful colors and the story of Christmas. 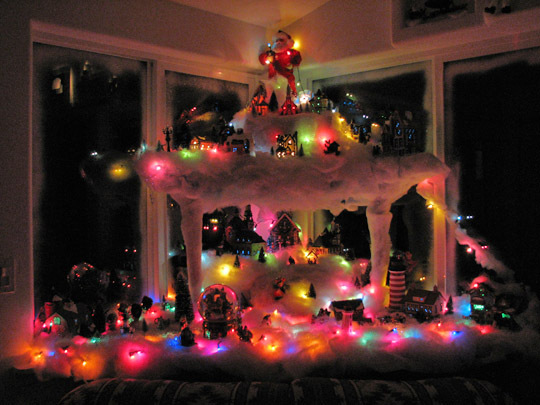 Once I had my lot at North Ranch, I really got into major decorating (which I had also done in my MI home every year). The 3 X 6’ window inside my shed office was decorated from A to Izzard. I did that for a few years but the village was in place for a month and I hardly had room for the computer and other office stuff…or a place to work. After my park model arrived and a sun porch was built, I moved my decorating into the sunroom. With a 50 X 70’ lot to create on, I also always had a big nativity outdoors, as well as a little one inside. 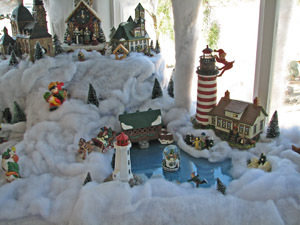 Each year I created it anew with boards or huge rocks or whatever my creative mind exploded with. It was so much fun. (I’d love to have that energy now!). 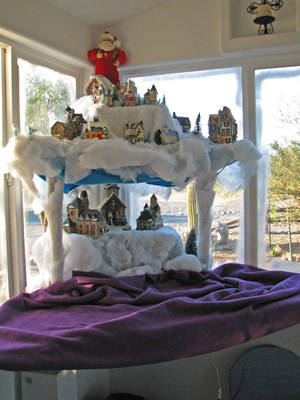 When the builder, Rich, built my sunroom, I specifically asked for several boards that I would eventually be able to put from one windowsill to another for my Christmas creations. 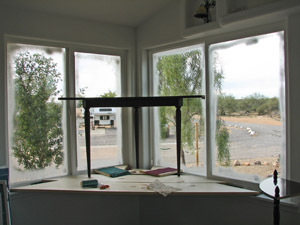 He not only did that but made the sills wider in those two windows so it would make a more sturdy platform for my village. It was different every year but this particular year, I put up the boards, then added a 3-cornered light-weight table on top and with LOTS of cotton batting, I created for the next 48 hours. That was roughly how long it took to finish it. I might have snoozed somewhere in that time period. Those were good years but one moves on. Although my apartment is probably about the same size as my park model/sun room, I will limit my decorating to a small basket of Christmas greens and red ribbons plus a small Nativity on a shelf just outside my door. God Bless until next week.